was canonized on September 23, 2015, at the Basilica of the Immaculate Conception in Washington D.C. by Pope Francis during his recent visit to the USA. Serrawas a Spanish Franciscan missionary to North America who worked among the Native Americans in the Spanish colonies there and founded nine major missions in California. 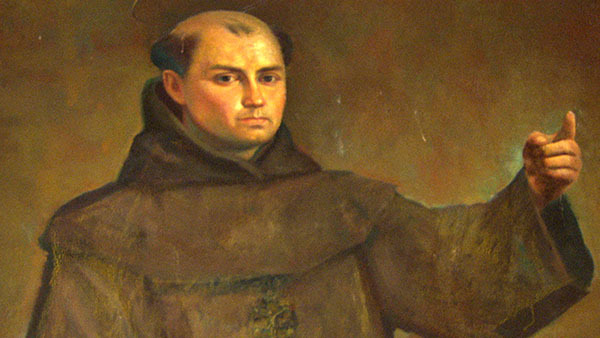 This zealous and industrious evangelist overcame great obstacles, including his own debilitated health, in order to carry out his mission, and became a buffer between Spanish soldiers and the Natives who were being mistreated. His motto was "Always go forward, never back." The following is a letter from his just before setting sail for Mexico. It is a very touching personal message to a friend, asking him to comfort his parents while he was away, knowing that he would probably never return alive. It is a message of faith, hope, and love in the fullest sense. Friend of my heart, on this occasion of my departure, words cannot express the feelings of affection that overwhelm me. I want to ask you again to do me the favor of consoling my parents, who, I know, are going through a great sorrow. I wish I could give them some of the happiness that is mine; and I feel that they would urge me to go ahead and never to turn back. Tell them that the dignity of apostolic preacher, especially when united with the actual duty, is the highest vocation they could have wished me to follow...Tell them how badly I feel at not being able to stay longer and make them happy as I used to do. At any rate they know well that first things come first; and our first duty, undoubtedly, is to do the will of God. Nothing else but the love of God has led me to leave them. And if I, for love of God and with the help of his grace, can muster courage to leave them, might I not suggest that they also, for the love of God, be content to forego the happiness of my presence? Let them listen attentively to the advice they will receive on this matter from their Father Confessor; and they will see, in fact, that now God has truly entered their home. By practicing holy patience and resignation to the divine Will, they will possess their souls, and attain eternal life. They should hold nobody but our Lord God alone responsible for the separation. They will find how sweet his yoke can be, that what they now consider and endure as a great sorrow will be turned into a lasting joy. Nothing in this life should cause us sadness. Our clear duty is to conform ourselves in all things to the will of God, and to prepare to die well. That is what counts; nothing else matters. If this is secured, it matters little if we lose all the rest; without this all else is useless. Happy they to have a son a priest -- however bad and sinful -- who, every day, in the holy Sacrifice of the Mass, prays for them, as best he can, and very often offers for them exclusively his Mass so that the Lord send them help, that they be not without the necessities of life; that he grant them the grace of patience in their trials, of resignation to his holy will, peace and union with their neighbors, courage to resist the temptations of the devil, and finally, at the proper time, a happy death, in his holy grace. If, by the help of God's grace from above, I succeed in being a good religious, these prayers of mine will be all the more powerful and my parents will be the first to profit from them." "Always go forward, never back!" A bite-sized Catholic cookie, British history nerd, die-hard romanticist, little sister figure, dabbler in Unionist politics, adventurous author, aspiring musician, and international net-worker. She sees herself as something of a latter-day bard, keeping alive the "golden legends" from the "brave old days" through story and song. She draws inspiration from the stories of the saints, especially the 40 Martyrs of England and Wales, and hopes to spend her life sharing the love and truth of Christ. The Song of a Grasshopper: The Spiritual Wisdoms of "Kung Fu"